I still can't quite believe that my gorgeous baby girl has turned one. I mean seriously where did that time go!? It feels like only yesterday I was sharing on social media about the arrival of Pickle and now we have a walking, talking one year old terrorising us around the house! As we celebrate her first birthday it only feels right that I share a few first birthday gift ideas that I think make perfect presents for that all important first birthday! When it comes to my home there is one thing that there is no shortage of, and that is photos of my family. I love to put frames on the window sills, the walls and even have a few canvases around. That means choosing a first birthday gift like the beautiful My First Year Frame* from Find Me a Gift was a no brainer. 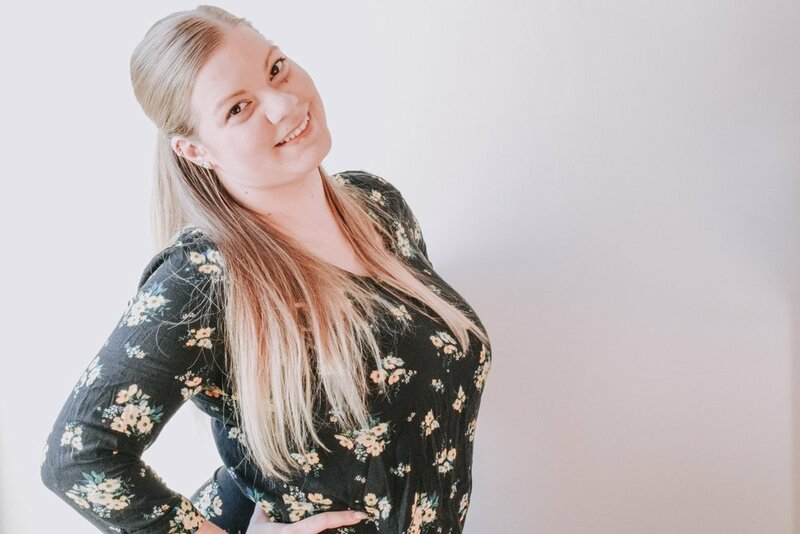 I am someone who loves to take photos so I have plenty to choose from to fill the frame and it will be so lovely to have the memories and milestones captured together. I never had a frame like this for Squidgy which I kind of regret, and I think it may be something that I need to invest in and do... better late than never right? My girls are both massive LEGO Duplo fans, but at three years old Squidgy still has moments when she will decide that the box full of Duplo we have is all hers, and subsequently she doesn't want to share. John and I thought that Pickle's first birthday was the perfect opportunity to start her own collection and so we bought her the LEGO 10832 Birthday Picnic Set ; an obvious choice when it comes to birthday gift ideas don't you think? 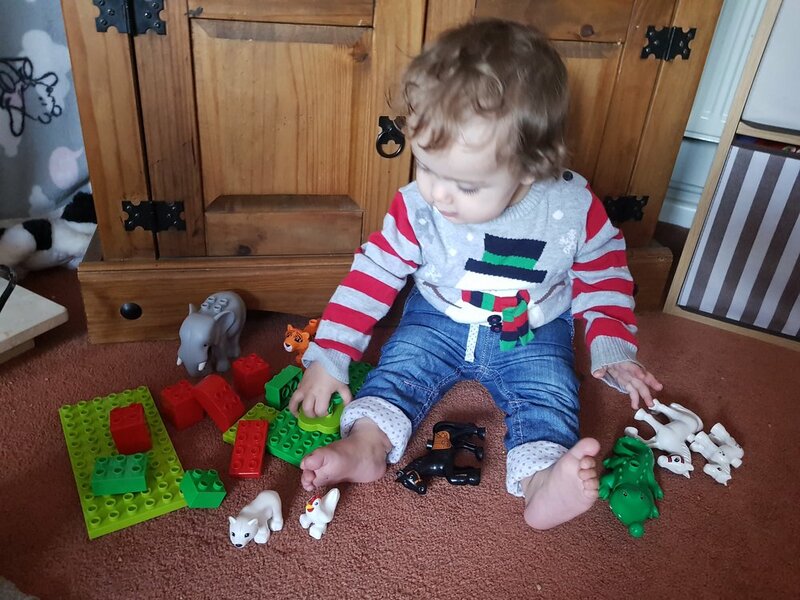 She also recieved a few extra Duplo sets from other members of the family and has her own box full of it now too! There is so much choice available in the LEGO Duplo range, so it is the perfect birthday gift for every budget. At the moment there is no shortage of items which Pickle will use as a phone, from our house phone to a book off the shelf. For her first birthday we thought we would attempt to stop her trying to steal our mobiles and invest in her very own VTech smartphone for her first birthday. Don't get me wrong she still loves to chat away into any object she gets her hands on, but amongst her first birthday gifts this phone toy is definitely one of her favourites; especially as it lights up and makes noises too. You may have seen my Christmas Gift Guide for Preschoolers and seen that Squidgy received a bike... and when it comes to our girls we always try and be fair so Pickle got one for her first birthday too. The difference is hers doesn't have peddles and stabilisers... it is the amazing ToddleBike2 * and she absolutely loves it. She walks really well independently these days; and since trying it for the first time after opening her first birthday gifts, running around the room on her ToddleBike2 never fails to put a smile on her face. Her legs are a little short to be able to sit on the seat just yet but she doesn't let that stop her! There are so many toys available on the market and I'm pretty sure that my children have had access to most of them. I absolutely love these TOMY Hide and Squeak Eggs* from Find Me a Gift. They're a great first birthday gift idea, great fun and best of all educational; from matching the colours of the eggs to the chicks inside to matching the shapes on the bottom to the egg case. To be honest, Pickle liked having a chew on them, where her sister joined in to actually put them back together and I loved watching them play together. Teething is one of the worst things that children have to go through, and although by the age of one they will have many already there are still more to come. Although she already has the central two teeth both on the top and the bottom, she is now cutting the ones either side all at the same time. Yep, you read that right. Four at once. That makes these amazing silicon teething items from Halia Rose* the perfect first birthday gift for her, she loves to play with them and have a good ol' chomp on them. Around the time of the first birthday celebrations of my girls they both began to take a greater interest in trying to work out how things work. Pickle has taken the exploration a bit further than her sister ever did and loves to build, knock down, open, close, and pull everything out to look at everything in turn. Stacking Cups are a great way to keep those little hands busy, whilst and helping them develop those all important motor skills. Pickle has an amazing set from John Lewis for her first birthday, which unfortunately isn’t available anymore, however I love these Disney Mickey Mouse Stacking Cups which are bright, colourful and of course you can’t go wrong with purchasing a little Disney. Pickle loves books, whether she is making noises pretending to read them herself or having them read to her. Some of my favourite books have been birthday gifts or gifts for Christmas for the girls, especially personalised books with them including withing the story. As they grow and recognise their name it’s amazing to watch them enjoy the stories even more. Pickle’s favourite book at the moment is Funky Pigeon’s personalised Name Discovers a World of Colour book which is not only a great first birthday gift because it’s personalised but teaches children colours and even how mixing colours makes new colours! Sticking with the birthday themed gifts, we invested in Spot's Birthday Party lift flap book as the perfect first birthday gift to go with Pickle's growing collection of Spot books. I loved Spot when I was younger and now she does too, so these books are such a lovely gift idea for her to read with us and even Squidgy who loves to try and read to her aswell! Pickle was fortunate enough to have some wonderful birthday gifts for her first birthday, even though it was only just ten days before Christmas. Not only did she receive some useful gifts, she also found herself with plenty of fun birthday gifts too! I hope that this post will give you some great birthday gift ideas for that special first birthday; whether you are looking for your own little one or someone else's child.